This is dinner tonight – the peppers are in the oven! Cut around stem of peppers like you would cut a jacko-lantern top, retaining the top with stem. Remove seeds carefully and wash and dry thoroughly. 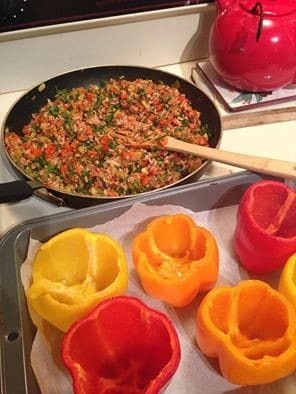 Place peppers in an oven safe dish and arrange upright and put tops back on. Bake at 350º F for 30 minutes. Meanwhile in a large non stick pan, saute onions, zucchini and carrots in vegetable broth for 5-6 minutes. Stir in the rice and tomato paste and coat thoroughly. Add parsley, dill, lemon juice, pepper and Herbamare (or salt) and stir to combine. 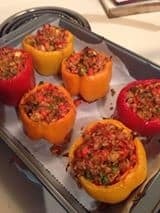 When peppers are ready, take out of oven and fill with stuffing. 30-40 minutes until the peppers are soft.